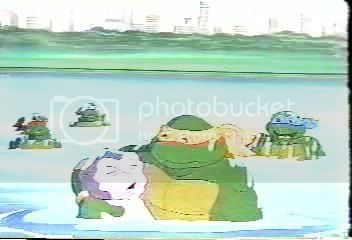 "Michelangelo saving the Alien from the Incredible Shrinking Turtles, Season Two." 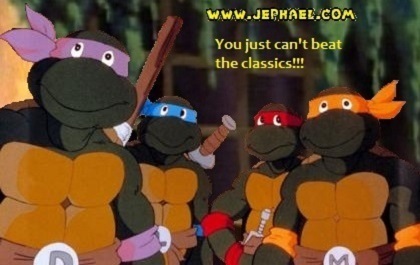 Now, I understand if you can't get all of that info, but something better than "The one where shredder and Splinter fought. 2. There is no limit to how many you can request. Give me something to do, but, do understand that 193 episodes is a lot to go through, so it may take a smidgeon of time to dig it up. 3. Do anything with these images. Wallpaper, Avitars, signitures, Personal collection, whatever. Have fun! 4. Maybe you don't have a specific picture you want, just a random shot of Donny with his bo drawn, or Mike eating pizza. That's cool. Just ask. Last edited by Zachatello00; 01-28-2005 at 10:28 PM. For the love of god that mouser looks horrible. lol. I have the DVD too, so request away. If one of us doesn't get it, the other will. Yeah, the mousers certainly got a much improved look this time around. I thought the mousers in "A Thing About Rats" were kept much closer to the original look in the comics. I also liked the Mousers from the new show, but they kinda look like that android dog from Jimmy Neutron. could you please post some screen caps of the mutated turtles, Lord Dregg, Mung,The Hi-tech, &amp; Carter. thanks so much I think I've probably got everything coverd lol. Sure man. Is there any particular picture you wanted? the mousersdont look that bad just diffrent. Great captions, you're doing a great job. hell yes! thanks for posthing those more would be wonderfull. whenever you get the chance though. What the sam in hell did they do to Mikey! nothing really because it was a vertual simulation. Thanks guys! I'll get a few more up after I get home from church. I want to get some of Carter's mutation and Dregg's full body shot. Vertual simulation, eh? What's Mikey suppose to be simulating? Awesome new screencaps, dude! Can you make one of the Neutrinos from the fourth episode? I love those wacky retro dudes!